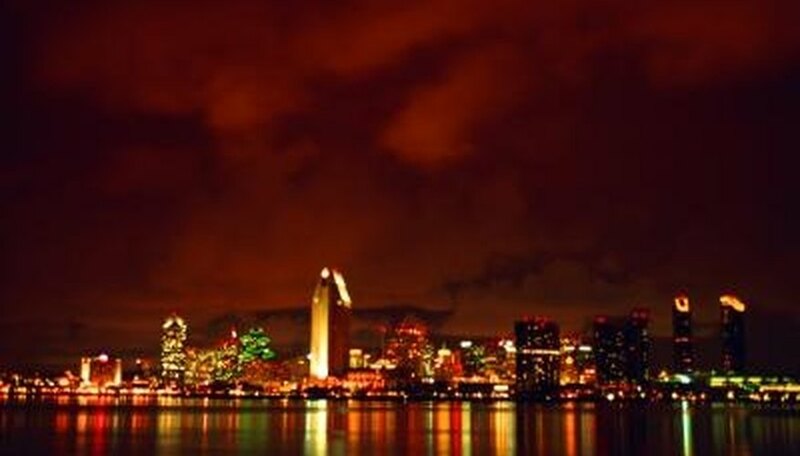 Located at the southwest corner of the United States, San Diego -- population 1,307,402, as of 2010 -- is a vast city bordered by the Pacific Ocean on the west and rolling hills on the north and east. The landscape affords plenty of places to spend time with your significant other and enjoy all the city has to offer. These places are all accessible to the public and aren't out of the way or off the beaten path. San Diego has many romantic spots to enjoy. Rising 800 feet above the Pacific Ocean, this mountain affords romantic couples the chance to take in a 360-degree view of San Diego and surrounding suburbs. The cross at the top of the mountain is meant to honor those who died fighting for the country in various wars. During the day, the view of San Diego is not to be missed. Add twinkling lights and a look at the ocean before sunset and it is easy to see how the romantic fires could kindle here. From the bay's western shores, the ideal place to spend some time alone is a place with a view of the sparkling downtown lights. The skyline is particularly dramatic from across the bay, and the view over the water from other places makes for a romantic setting. Restaurants with a bay view also provide ambiance, and you might find bargain dining while you're at it depending on what specials are offered. Cruises in the bay offer a chance to get into the water without getting all wet. Built in 1888 and restored in 1977, the Hotel Del Coronado (hoteldel.com) is a beachfront property with the Pacific Ocean steps away. The hotel's interior affords sweeping views of the lobby, and accommodations facing the ocean allow you the chance to take in the Pacific without leaving the room. Dining options such as 1500 Ocean (dine1500ocean.com) give you the chance to dine with a water view or in a room with white tablecloth and a crown for a chandelier. From its start as a single house in the 1850s, the Gaslamp Quarter (gaslamp.org) has turned into a destination for travelers. After dark, with the lamps lit and a dark ambiance in the air, you can get lost in romantic gazes over drinks at a bar or nightclub, or you could share a full dinner with someone. There are places to shop inside the quarter, allowing you the chance to walk around before settling in for the night in one location. Right along the San Diego beach front are a series of jagged cliffs that plummet to the water below. Sunset Cliffs Boulevard hugs the Pacific Ocean. Steps lead to the beaches below in many areas, but you can take in the ocean view from above the cliffs or below. A view high in the air above the sand can be just as intoxicating as one in the sand looking up at the rocks. Ungrey, Steve. "Romantic Spots in San Diego." Dating Tips - Match.com, https://datingtips.match.com/romantic-spots-san-diego-8238311.html. Accessed 20 April 2019.